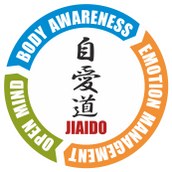 Jiaido is a non-violent physical activity known as internal martial art. 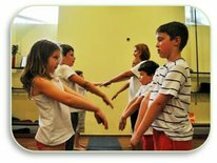 This program is designed for children to improve their physical, mental and emotional abilities and at the same time it provides them with a tool to learn how to use their own mental and emotional ability in a constructive way. Besides it imporves health and the level of fitness, cultivates vital energy (Qi) and helps to relax. The practice is based on conscious body movement breathing exercises, pair work, bodywork and social creativity. 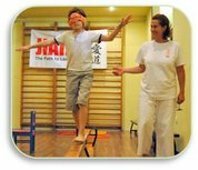 It is easy to learn and remember the movements and all activities in the program. Conscious movement practice has a great influence on developing body awareness. Body awareness includes attentional focus and awareness ofbody movement and awareness of internal body sensations. It is the subjective, phenomenological aspect of proprioception and interoception that enters conscious awareness, and is modifiable by mental processes including attention, interpretation, appraisal, beliefs, memories, conditioning, attitudes and affect. Body awareness leads toself-awareness also. Pairwork is a learning activity which involves practitionairs to work together in pairs; to learn to relate and comunicate in collaboration. Bodywork is the general term for therapies that work with the body as a whole and use soft manipulations and breath work to let the body return to its original state of relaxation. Creative activity grows out of the relationship between an individual and the world of his or her work, as well as from the ties between an individual and other human beings. Much human creativity arises from activities that take place in a social context in which interaction with other people and the artifacts that embody group knowledge are important contributors to the process. Creativity does not happen inside a person’s head, but in the interaction between a person's thoughts and a socio-cultural context.